I've been planning this quilt out for about a year and I am so happy with it now that it is finally done! As one of the owners of Fancy Tiger Crafts, I have the wonderful job of selecting and purchasing the fabrics that we sell and I love each and every one of them! I see so many amazing fabrics come through the store each week and they don't hang around long. I often want to make something out of all of them, but there just isn't enough time in the day. Looking at this quilt is like taking a walk down the Fancy Tiger fabric memory lane. About a year and half ago I started cutting 1/4 yards of all my favorite prints that came through the store, starting the most epic stash of all time! This quilt was the perfect project to showcase all of those fabrics. 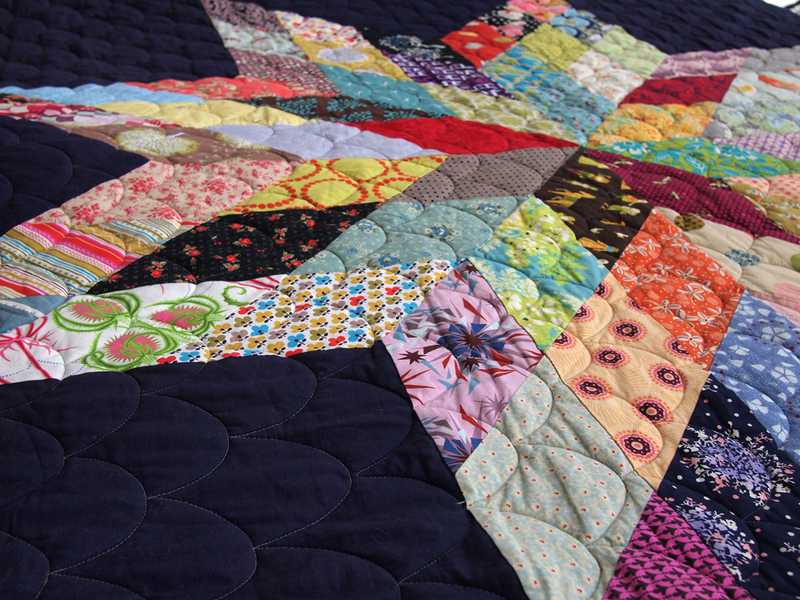 It is a traditional star quilt that has been magnified so each of its 8 points is made up of 9 different fabrics. By making the star this size all of my 72 different fabric pieces were big enough to show off the fabrics. 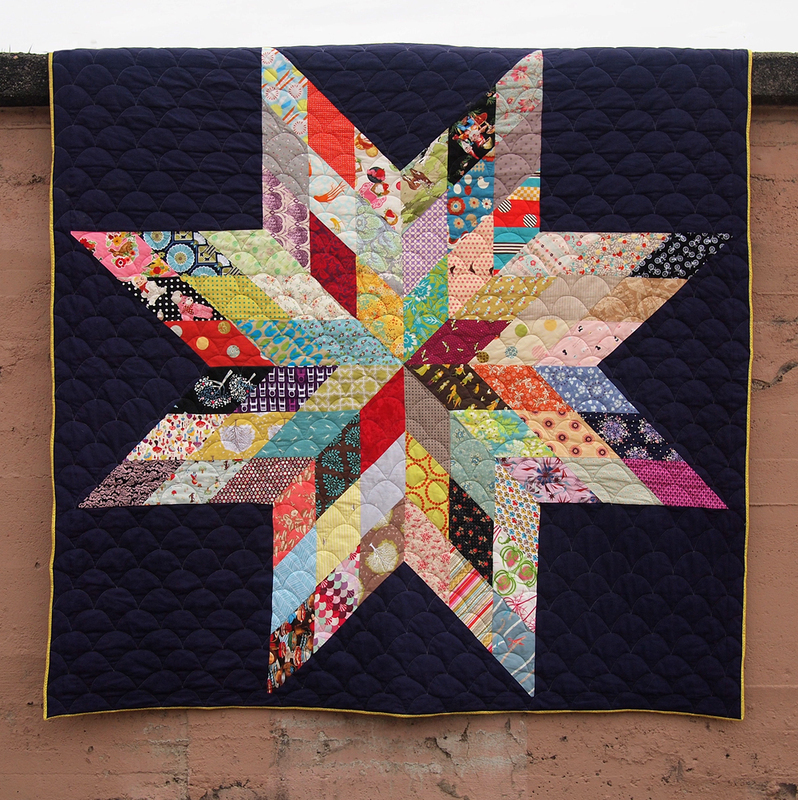 Once I had the star together, I experimented with different colors of Kona cotton solids until I found a saturated royal purple background that really makes the star pop. 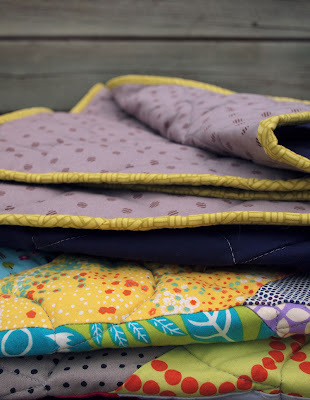 I love making tons of queen size quilts and I usually have them quilted by professionals with those amazing long arm machines. For this one, I choose to use a fluffy wool batting and a half-moon pattern for the quilting. The result is an adorable puffy pattern that doesn't take away from the fabric prints in the star. For the back I chose a simple grey print by Momo and it looks beautiful with the royal purple front and chartreuse binding. I love this quilt! As a new quilter, this is my current masterpiece. I'll have to see what I can come up with next - I've already started a new stash of my current favorite fabrics! Can you share the pattern you used? This is awesome!! This is one of the best quilts I've ever seen. And you say you're a new quilter? Great start! Holy awesome! How did this quilt not come up in quilt discussions at The Makerie? I, too, would like to know where you get it quilted professionally. Love the star - do you have a pattern? Thanks everyone! I just made up the pattern for this. You are all so sweet and flattering, I guess I should consider publishing it? I'll work on it. My last 2 quilts were quilting by Dawna and Amy of Rendezvous Quilts in Thorton. Check them out here! 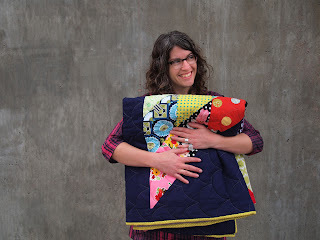 I've been cruising for Lone Star type quilts to make and yours is the most modern and stunning! L-O-V-E it. Jaime did you ever make a pattern for this awsome quilt? Your fans are still waiting!!!!! I love this. I have been looking for something like this to make a queen size quilt. where can I get the pattern ? Liesl Gibson Book Signing this Saturday! Almost A Million New Fabrics! New Heather Moore Organic Fabrics! The Makerie Retreat was Bomb.com!